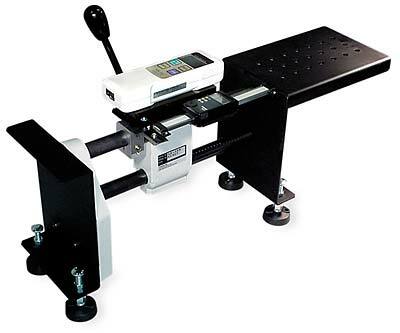 The LH-220 Horizontal Manual Lever Test Stand provides maximum versatility and reliability. The stand will accommodate any of the standard range Imada force gauges. The large working platform accommodates a wide variety of samples—ideal for peel test measurements. The stand is unaffected by gravity and does not employ a return spring, making it perfect for crimp testing and other applications where rapid sample loading is desirable. The lever action provides for quick, consistent tests. Threaded feet enable the test stand to be easily levelled. The LH-220S model is equipped with a digital distance meter.